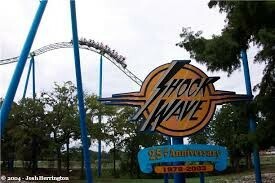 The Shockwave has congruent, the loops are the same dimension and there are triangle beams to keep the ride up. There are two parallel lines that run before the two loops appear on both sides. The Batman has no parallel lines like the Shockwave. There are few loops but they aren't the same size (some are more oval shaped than the other).The only thing the Batman could have are similar shapes and figures from the trusses (squares). Even though the Texas Giant is mainly made out of wood, has triangle and square shapes to build its form. The shapes are all similar and are not many parallel lines. A water ride at Six Flags Over Texas: Aquaman Splashdown is known for dropping down a steep hill at a 110 degree angle, 50-foot waterfall at 30 miles per hour, straight into over 200,000 gallons of water below. 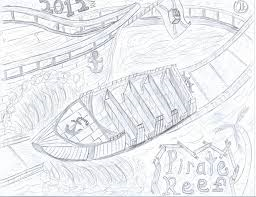 The ride itself has five rows that can hold up to four people a row. The Titan, Texas Giant, Blue Streak and Millennium Force all shows similar transformations. Transformations are thorough or dramatic change in form or appearance . Like when a roller coaster goes up a hill or goes in loops. The roller coasters from Six Flags Over Texas and Cedar Point show different transformation but they are similar in some ways. A triangle is the strongest kind of shape and can withstand more force on each side. If you people ever seen bridges, they are made of many trusses together. Most buildings are supported by a truss frame. A roller coaster is entirely made of trusses. The entire support from the base to the tracks are made of huge trusses that can support a lot of pressure from above. 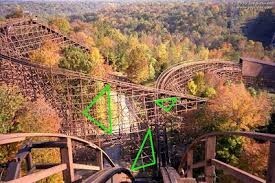 Most trusses are made out of metal or steel unless its a wood roller coaster like Texas Giant, has wood trusses. All going up a steep hill as it collects potential energy. The very top of all roller coaster hills has the greatest potential energy while the bottom of the hill has the greatest kinetic energy. All roller coasters start with a steep hill going up to store potential energy so when the ride goes down, the better the kinetic energy. So the better the potential, the better the kinetic. A.) Triangle measurements help support roller coaster beams. Without them roller coasters wouldn't be as safe as they are now to ride. Plus, triangle trusses are more popular to use then squares and any other shape. B.) 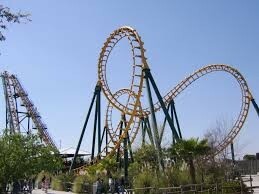 Congruent and similarity shapes makes rides fun, like the loops in Shockwave at Six Flags Over Texas. Having congruent shapes in the roller coaster beams keeps the ride equal and then similar shapes are always used in rides. Congruent and similar shapes are pretty much the same. C.) How much space is needed in each row in a roller coaster, how many people on one ride. You have to be accurate so no accidents happen.